Sparqube Lookup Column Suite is powerful component suite that significantly enhances and extends standard lookup functionality. It allows referencing list data from any site within site collection, across site collections and provides set of additional controls for easy and intuitive data look-up and data tracking. 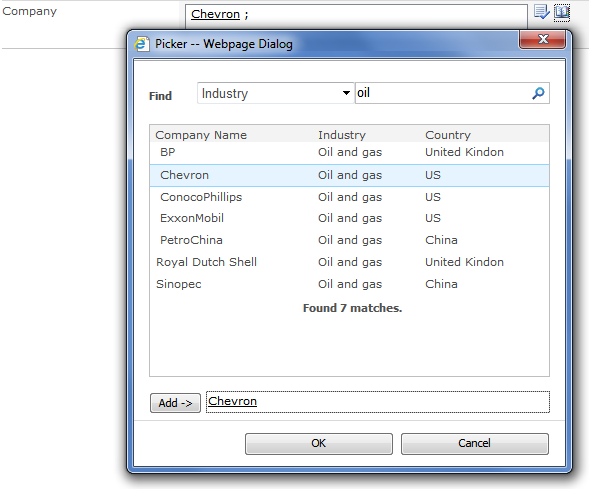 Picker Dialog and Auto-complete textbox will allow you to work with large list items. You can also apply list view filter or specify custom filter to reduce number of possible items for lookup column and prevent unwanted data selection. Moreover, Sparqube Lookup columns provide ability to build parent-child relationships between columns in current list (cascaded lookup), so data entered in one field filters out options present in another. Sparqube Lookup is the suite of three components consisting of the following SharePoint columns: Sparqube Lookup Classic, Sparqube Lookup Extra and Sparqube Lookup Tracker. Each column serves its own purpose and has unique set of features useful in certain scenario. Sparqube Lookup Classic extends capabilities of standard SharePoint lookup field allowing to lookup and reference data from the same site or other site from the same site collection (cross-site lookup). The limitation to one site collection is specific to native Lookup field architecture on which Lookup Classic is built. Lookup Classic is backward-compatible with native Lookup field and can be converted to and from native Lookup preserving column data. Lookup Classic has wide variety of features and is fitting the majority of lookup use cases. Sorting and filtering in list views are not supported. Source item additional fields cannot be displayed. Datasheet view usage is limited to read-only. Conversion from/to standard lookup is not supported. Same is true for conversion from/to Classic Lookup, thus Classic and Extra are mutually incompatible. In other words, Lookup Extra is a valuable alternative to Lookup Classic in scenarios where classic lookup approach will not work, but lookup in general will be possible with certain limitations acceptable as a compromise. Sparqube Lookup Tracker has logic reverse to lookup columns. It allows showing items which are referencing current item by lookup. Basic sample of Tracker scenario is the customer and his orders. If orders are located in the list and reference customer by lookup, these orders can be tracked from the customer list item. Since the components are complementing each other to solve wide variety of different objectives, we've decided to market and promote them as a single comprehensive Lookup product suite with no price increase. So, anyone using our former Sparqube Lookup (now Sparqube Lookup Classic) will be pleasantly surprised to obtain two more Lookup components completely free of charge during upgrade. © 2012-2017 ArtfulBits CZ s.r.o. All rights reserved.